Every morning after breakfast, Wilbur walked out the road with Fern and waited with her till the bus came. She would wave goodbye to him, and he would stand and watch the bus until it vanished around a turn. While Fern was in school, Wilbur was shut up inside his yard. But as soon as she got home in the afternoon, she would take him out and he would follow her around the place. If she went into the house, Wilbur went, too. If she went upstairs, Wilbur would wait at the bottom step until she came down again. 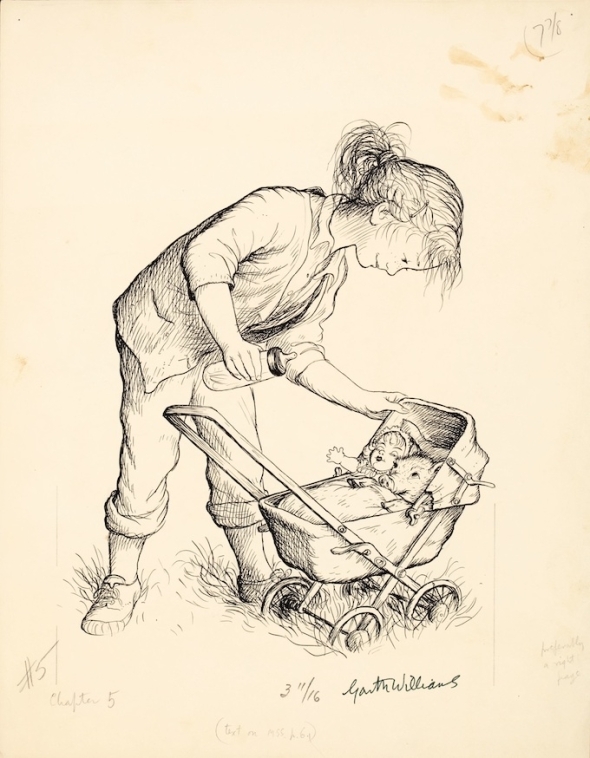 If she took her doll for a walk in the doll carriage, Wilbur followed along. 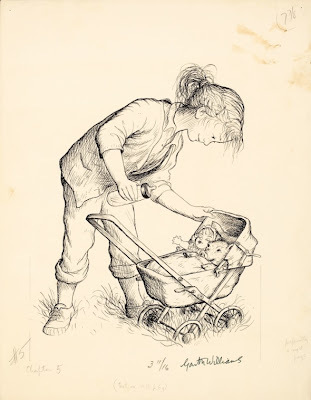 Sometimes, on these journeys, Wilbur would get tired, and Fern would put in the carriage alongside the doll. He liked this. And if he was very tired, he would close his eyes and go to sleep under the doll's blanket. He looked cute with his eyes were closed, because his lashes were so long. The doll would close her eyes, too, and Fern would wheel the carriage very slowly and smoothly so as not to wake her infants." I loved this as a child. I always got very weepy about Charlotte's death.